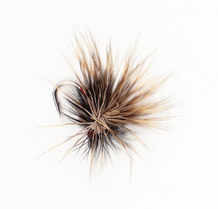 Dryfly selections to match most situations are listed on this page. Ask if you have any special patterns to match the hatch on your waters. Moth like flies that feature on still or running water. Always worth a cast in the evening, try skating them in the dark to tempt a specimen! Tan, Natural & Olive tyings included. Tied to imitate a wide range of upwinged flies common on still and running waters. All sizes have their uses on still or running waters. Tied on fine wire medium shank #16 hooks, ideal for wild trout and great for catch and release. A straggly version of the original, floats well and brings fish up, even if they are not rising. Tied with a CDC wing and body, try this fly on picky fish.